Written by Miranda Cooper, Brian Higgins, Tim Powell, Matt Gray. Keyboards & programming: Tim Powell, Brian Higgins, Miranda Cooper, Owen Parker, Fred Falke, Sascha Collisson, Matt Gray. 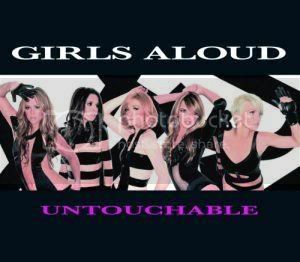 "Untouchable" is the third and final single from Out Of Control. It was released on 27th April. Peak position: #11 in the UK charts. The emotional twangy guitar noise was the result of Xenomania musician Jason Resch responding to a request for something "special". Brian Higgins says he could happily listen to the guitar part for an hour on a loop. The track was finished for Out Of Control knowing that the album's first two singles were likely to be "The Promise" and "The Loving Kind", meaning that there would be time to revisit and perhaps remix the song if it became the third single. The song is Girls Aloud's longest yet, at a full runtime of 6:45.
x (...) it's epic and dreamy and a bit of a diversion from the usual GA pattern while still being recognisably very Girls Aloud. But the issue of how to trim down a song twice the length of an average single without stripping it of all its character is a tricky one. And to be honest, it hasn't been done entirely successfully. The basic gist of the song is still here: Nicola still gets the lion's share of the verses, and rightly so, the verses remain haunting and wistful, and the bridge sort of zooms up and kicks into a dancefloor stomper of a chorus that's uplifting while still being very sad, and there's still the amazing "without any meaning, we're just skin and bones/like beautiful robots dancing alone" refrain at the end. These are all good things. However, someone has made the regrettable decision to vocoder the living daylights out of the verses for no good reason, which does rob them of a lot of their emotional kick. And the shortening of the intro, and the removal of the repetition of the first few lines (meaning that we hit the chorus for the first time only about 40 seconds into the song, which is a little too hurried for me) all go a little way towards removing the intensity of the album version that I loved so much in the first place.